Mick was a wonderful dog for a girl to have while growing up. He and his girl, Sarah, did everything together, including 4H and flyball and went to many places together in the US and Canada. When Sarah had to go to college, Mick was unhappy until he got to see her again. 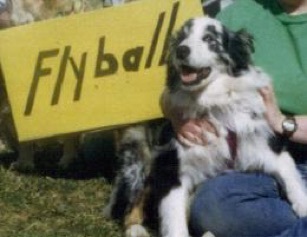 To make him feel a bit better, he continued to do flyball with another handler during Sarah’s first few years of college. Everyone who knew and worked with Mick loved him. He was a one in a million dog.